"The kids who are interested will come and skate whatever you put there, so you may as well build what you think is the most optimum." Filmmakers Coan Nichols and Rick Charnoski would certainly be considered friends of the renegade skateboarder subculture, and they first collaborated on 1999's Fruit of the Vine, a grainy, manic Super 8 documentary on the backyard pool skating underground. With their latest project, the subject is still skateboarding, but their focus is on skateparks of the Northwest (hence the title), and more importantly the people who build them. Nichols and Charnoski allow the skatepark builders, a crazy bunch of die-hard skaters with colorful names like Q, the Ox, the Greek, and Munk, to offer bits of their skate-centric world outlook as we see them traversing the Northwest installing their custom-made masses of wildly curving concrete like modern-day Johnny Appleseeds. We learn indirectly that a lot of them started cobbling together early public skateparks in Oregon in 1990, and in Northwest we see them, now 12 years later, still assembling even more diabolically twisted creations that are seemingly designed to heighten the speed and thrill of daredevil skating. But at its center, Northwest is all about the mystical vibe of skateboarding, and really not much else, unfortunately. We never get more than a cursory glance into the individual skaters, and even when they are identified by name they still remain largely anonymous throughout. One shouldn't go into this documentary expecting a deep, well-heeled history of skating and skateparks, because underneath it all, Northwest is all about the pure rough-and-tumble thrill of the skateboard lifestyle, and not a timeline. The moments of simple narrative give way to Nichols and Charnoski's endless (well, 46-minute, anyway) and sometimes surreal shots of skateboarders riding all manner of curved concrete walls, and the frenetic skill of the riders is captured with a kind of raw and very real glee, made even more edgy thanks to the Super 8 format. While there maybe isn't a lot to necessarily learn in Northwest, the visual chops of the filmmakers is a sold compliment to the subject, and their use of a diverse set of local music on the soundtrack (from punk to folk to ethnic) adds to the gravity-defying actions of the participants. A film like this is more a series of visuals than it is an historical compendium, and I suppose if you sit down to watch a skateboard documentary then you should expect to see skateboarding. And lots of it. Note: The backcover lists a runtime of 84 minutes, which is a bit deceptive because it includes the times for all of the outtakes. Image Transfer Review: Northwest has been issued in its original 1.33:1 full-frame aspect ratio by Plexifilm, and for a film shot on Super 8 I suppose the transfer is a pretty solid one, considering its simple origins. As expected, the source material is a bit rough and raw around the edges (the filmmaker's intent, no doubt), but the transfer itself is more than sufficient and presentable. Audio Transfer Review: Audio is presented in simple, basic stereo, with the sporadic narration and voice-overs rendered cleanly and understandable. The filmmakers use of a truly oddball mix of music is where the limited audio range actually manages to sound noticeably fuller and more slightly more spacious. Not flashy, but certainly adequate. Extras Review: Since the feature only runs a scant 46 minutes, Plexifilm has seen fit to provide a set of ten outtakes, most consisting of even more skateboarding set to eclectic music to pad the total runtime, and they are available with the handy Play All option. Only a couple of the scenes have any narration (and it's a doozy about a skateboarding bum who lived in dumpster), and one does not have any sound at all. Also included is a foldout booklet with seven photos and a written narrative by Coan Nichols, as well as a theatrical trailer that runs 4m:30s, and that was made to promote the film before it was even titled. The disc is cut into 13 chapters, and does not feature any subtitles. Nichols and Charnoski dedicate their film to "those who create their own reality," and considering I could never master the concept of staying vertical on a small, wheeled board, I would have to agree. 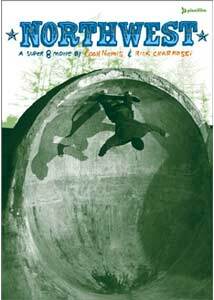 Their visual style and the decidedly low-rent format of Super 8 mesh exceptionally well, but the substance may come up a little short, unless you're a skater.